The Stylish, luxurious and robust Sportage turbo diesel platinum wins again with OzRoamer magazine awarding it top marks as its 2013 AWD SUV under AUD60,000 Car Of The Year. The Sportage saw off an impressive field of finalist – Mazda CX5, Hyundai IX35, Mitsubishi Outlander and Ford Kuga – to claim the top spot on the judges’ cards. As always with every KIA vehicle that comes into Australia the Sportage has undergone extensive localized tuning to ensure the car provides the ride and handling experience Australian owners want and deserve. Along with the pioneering 5 years unlimited kilometre warranty, capped price servicing and road-side assistance proves the purchasing another brand with recognition likes this is futile. As far as a soft off-roader goes the Sportage is the best by far. Kia’s much-lauded Cerato small car has highlighted its 2015 model year enhancement with the launch of a high-value addition, the S Premium. Sitting between the S and the Si grades, the S Premium will add satellite navigation, rear view camera, 7-inch touch screen, 16-inch alloys, auto headlamp control, DVD player and more for a price-leading $24,590 _ a step up of only $2300 over the entry-level automatic. Available in both 4-door sedan and 5-door hatch models the new Cerato S Premium carries all the extensive kit of the S model _ including 1.8-litre GDi engine, six airbags, ABS, ESC, tilt and telescopic steering wheel, 6-speaker audio system with remote control, Bluetooth streaming and hands-free, cruise control, front and rear parking sensors, trip computer, air conditioning, 60:40 split fold rear seat, power windows, keyless remote _ with some added polish. Cerato not only highlights the Kia commitment to safety and value but is one of the most stylish small cars in the Australian market, sharing cues with a range of Kia’s design award-winning models,” Kia Motors Australia Chief Operating Officer, Damien Meredith, said. In addition to the launch of the S Premium grade the 2015 Cerato upgrades will see satellite navigation as standard in S Premium, Si and SLi while the 6-speed manual transmission will be available only on the S model. All other grades will have the 6-automatic as standard. Once again KIA has proven itself a major player in the automotive industry and is taking over and amazing people around the world. Their current award is for its GT4 Stinger concept which has just been awarded a silver medal in the 2014 “I.D.E.A” awards (International Design Excellence Awards). The 2014 competition included 2000 candidates from 39 countries with each entry evaluated for innovation, benefits to the user and client, sustainability and visual appeal. 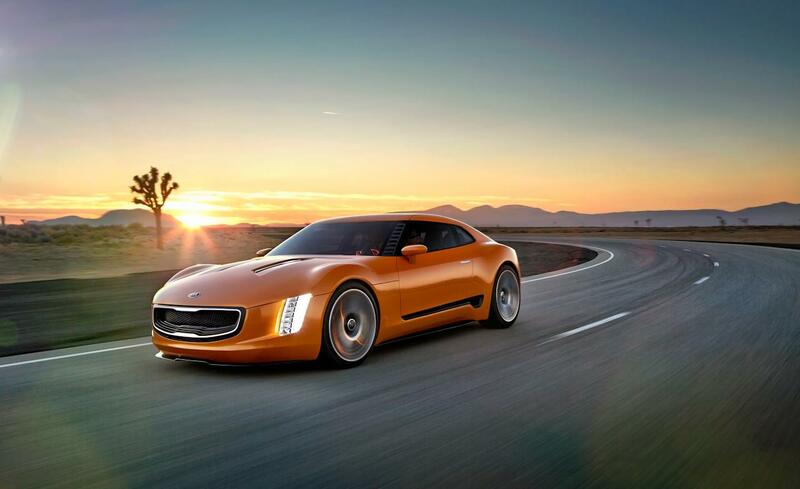 The GT4 Stinger was design for America selfishly as KIA is not transporting the Pro Cee’d GT to the Americas. However, God help me if I didn’t want the Stinger to come to Australia. There is a definite market for this 2.4L Turbo charged rear-wheel drive Coupe in Australia no as Ford and GM move to stop production of their high powered rear wheel drive sedans. Tom Kearns stated that the KDCA (Kia Design Center America) designed the GT4 Stinger with what their vision is for the ultimate KIA performance vehicle would be with a keen focus on drop-dead-gorgeous exterior styling and unparalleled driving dynamics. I am hoping that this vehicle will come to Australia along with the V8 Luxury Quoris, 4WD Mohave and V6 rear-wheel drive Cadenza. The KIA design team, led since 2006 by KIA motors Corporation president and chief design officer Peter Schreyer, has consistently garnered praise for its innovative, European influenced work, transforming the KIA brand into a sought after product that consumers not only love to drive but are proud to have sitting in their driveway. The I.D.E.A Honour is the third major design accolade for KIA’s second-generation passenger vehicle… Can’t wait to get one. Kia announces sponsorship of England Women’s Cricket Team in conjunction with the England and Wales Cricket Board. Kia Motors (UK) Limited has announced a major new sponsorship deal as the official partner of the England women’s cricket team. 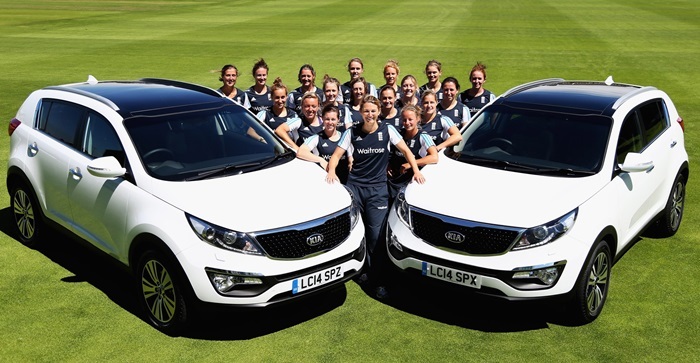 The two-year partnership will see Kia become the official car of the England women’s cricket, with 19 all new Kia Sportage vehicles set to be provided to the England women’s team. The historic deal represents the first ever standalone commercial arrangement for the England women’s team, which will give Kia a range of sponsorship and marketing rights around England women’s team, including in-ground activation at women’s international matches in England. Under the terms of the agreement Kia will become the sole title sponsor of England women’s home Test matches during the next two years, first against India at Wormsley Cricket Ground this August, followed by the Women’s Ashes Test against Australia next summer. 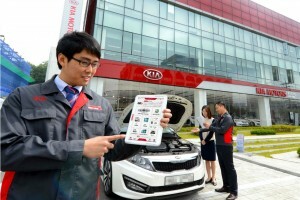 Kia Motors has announced today details of its new mobile Global Diagnostics System (GDS-Mobile), which has been introduced to improve the level of customer service provided by the brand’s expanding aftersales network. The new GDS-Mobile system is the third generation of Kia’s vehicle diagnostics system available to its dealers, and is the world’s first mobile based ‘total diagnostic solution’ designed and optimized for use on mobile tablet devices. The new system will allow the brand’s highly-trained vehicle technicians to more quickly and more effectively identify any faults with customer vehicles. Wireless connectivity and Bluetooth® support allow technicians to move around a vehicle, instead of having to return to a fixed heavy diagnostic computer or move a cart around the workshop. GDS-Mobile doesn’t necessarily require a wire to connect to a vehicle, as the Compact Vehicle Communication Interface provides Bluetooth® and Wi-Fi Direct® functions. With a growing level of advanced, high-tech equipment found in many Kia vehicles, GDS-Mobile’s new vehicle software management technology allows technicians to quickly and easily check and update every electronic system in the car. Both vehicle and service information on the regional server – transferred to the mobile device – is updated in real time, from a central database housed in Kia’s global headquarters in Seoul, Korea. GDS-Mobile is now available for Kia workshops in every market except China, which will receive its own version towards the end of 2014. As well as boosting service efficiency and quality of maintenance and repair work, the system will also cost Kia dealers substantially less than existing diagnostics systems. A clearer interface – and touch-screen functionality – make the system easier to use. Steven Yoon, Director of the Overseas Service Group, Kia Motors Corp., commented, “We have been committed to providing better service quality as well as enhancing the Kia service environment. GDS-Mobile is a great achievement as it is the world’s first mobile-based “total diagnostic solution” that allows us to innovate the vehicle diagnosis process. In the simplest sense, it enhances mobility and convenience when a technician repairs a vehicle thanks to the handy tablet diagnosis tool, while it also enables more accurate completion of repair work by using real-time updated service information. Solid sales across key models have kept Kia ahead of the curve with a return to the Top Ten sales leaders list for June. 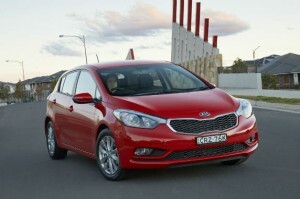 Sales of 3305 new cars for June, the second best month ever for Kia in Australia, underscored first half sales of 15,299 and put KMAu on target to maintain the company’s business plan through to the end of the year. Mr Meredith said that one of the most pleasing aspects of the June sales was that there was strong demand for a range of Kia models. While Rio continued to lead the marque’s sales with 967 finding new homes in June, the enhanced European-sourced compact SUV Sportage weighed in with 870 new registrations, followed by the small car Cerato which stepped up with 856 sales. The Sorento large SUV, with an all-new model due early in 2015, recorded 230 sales while Carnival, also looking towards the next generation’s arrival in the first quarter of next year, continued to perform well in a shrinking large people mover market with 185 sales. Along with the style, safety and performance of the range, Kia’s customers also benefit from the standard 5-year unlimited kilometre warrant with 5-year capped price servicing and the Kia Family Like Care service philosophy. Kia’s stylish Sportage is continuing to wow critics and buyers alike with OzRoamer magazine awarding the Platinum 2.0R CRDi top marks as its 2013 AWD SUV under AUD60,000 Car Of The Year. The Slovakian-built compact saw off an impressive field of finalists – Mazda CX5, Hyundai ix35, Mitsubishi Outlander and Ford Kuga – to claim the top spot on the judge’s cards. “This prestigious award is the result of a rigorous subjective and objective process throughout the year by a number of judges,” said OzRoamer Editor, Rob Fraser. Awards judge Chloe Fraser said the surprising versatility of the Sportage was impressive and that it should “satisfy the adventurous nature of most buyers”. “The Platinum 2.0L ‘R’ diesel with the 6-speed automatic has plenty of power and is super economical. It is amongst the best in its class,” she added. Kia Motors Australia (KMAu) President and CEO, Mr SH Cho, said the multi-award winning Sportage has continued to find acceptance with a diverse range of industry experts and buyers since it was first launched in 2010. “It is always nice to receive recognition for your efforts, and for KMAu the generous praise Sportage continues to earn is very satisfying, “Mr. Cho said. 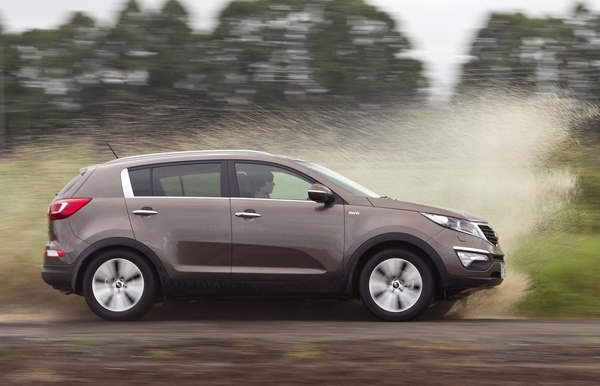 In common with the full Kia range, the Sportage has undergone extensive localized tuning to ensure the car provides the ride and handling experience Australian owners want and deserve. Like all Kia models, the Sportage benefits from a five-year capped price servicing and the full range of Kia Connect advantages. This is an exact article from Kia Motors Vision 21 issue 139 magazine. 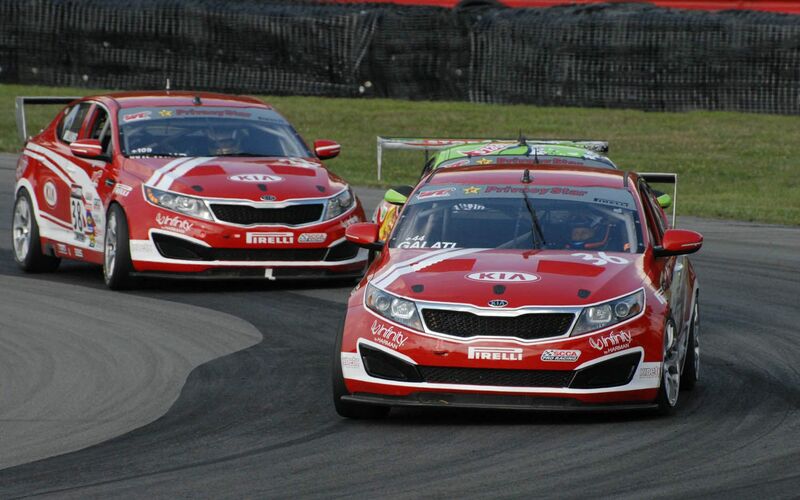 Kia Racing scored back-to-back podium finishes – including its second win of the 2014 season – in round three and four of the Pirelli World Challenge (PWC) at Barber Motorsport Park in Birmingham, Ala. Mark Wilkins piloted the number 38 B.R.A.K.E.S Optima turbo to victory on Saturday in round three and currently leads the Grand Touring Sport (GTS) Driver championship points. Teammate Nic Jonsson, in the number 36 DonorsChoose.org Optima turbo, followed that performance on Sunday with a second place in the driver standings behind Wilkins. The team’s outstanding results at Barber move Kia into first place in the Manufacturer Championship standings ahead of Porsche, Ford and Chevy. Jonsson’s second-place finish on Sunday came in dramatic fashion as he held off two hard-charging Chevy Camaros to the checkered flag. With three podiums – including two wins – in the first four rounds of the 2014 PWC season, Kia carries the manufacturer and Driver Championship points leads into rounds five and six in Detroit, Mich., May 30 – June 1. The team is optimistic, having won at Detroit last year, and looks to duplicate that performance in the Motor City again. I believe the KIA Soul is one of the most underrated cars on the market in Australia to date. This vehicle provides practicality with a difference. It has all the great features that you would need in a modern day vehicle and is a uniquely designed car. The features include reversing camera, sensors, a bonnet that you can see (a rarity in this day and age) clever storage space and easy access getting in and out of the vehicle. You can change the amount of storage space in the vehicle by lifting and removing the compartment underneath the cover. 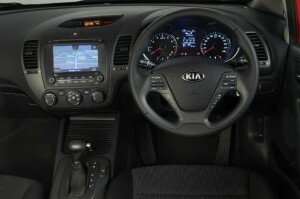 Compartments are another example of the smart thinking behind all KIA vehicles. It has 3 deep separate tubs in the back for caring various things such as liquids so if they spill or break apart you can simply remove it and tip it out, wash it and put it back in the back. As mentioned before access to the vehicle is exceptionally easy with the height and the door sill’s perfect for those who have had knee surgery and hip replacements and for Children. 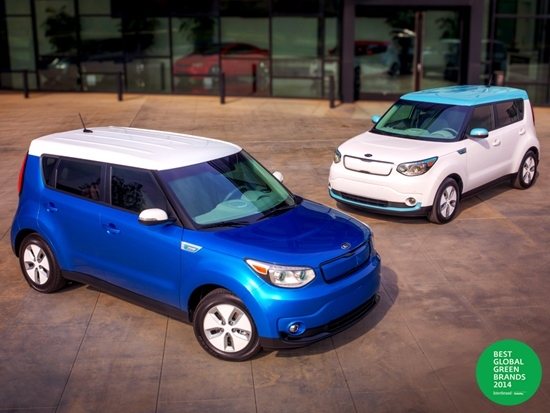 A few of the features that make the KIA Soul a perfect choice for both the young and older generation. Kia Motors has been a rising star among the global automotive brands in terms of environmental friendliness, most recently ranking 35th out of 50 global brands in international brand management consultancy, Interbrand’s 2014 Best Global Green Brands. Kia is one of ten automotive brands that made the top 50, and it has been climbing Interbrand’s Best Global Green Brands ranks since 2012—first ranking 87th, then 37th in 2013, and now at 35th in 2014. This is a clear testament to Kia’s commitment to grow as a green, sustainable automotive brand. This year’s results can be largely attributed the debut of more ‘green’ vehicles, which have helped Kia grow as a leading brand in sustainability. 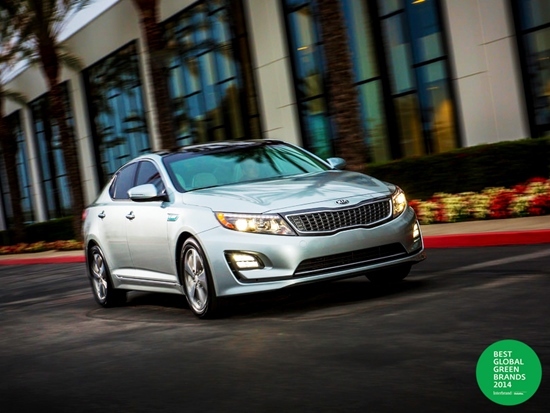 This includes Kia’s first electric vehicle, the Soul EV, which made its world debut at the 2014 Chicago Auto Show this past February and will be sold in select countries later this year, and the Optima Hybrid* and Cadenza Hybrid* currently sold in select markets. Our vehicle production is guided by principles of sustainability, and last month, in an annual ranking of the eight top-selling automakers made by the Union of Concerned Scientists (UCS), Hyundai-Kia was named the greenest automaker in the U.S. For more on this distinction, click here. In 2012, Kia first introduced the latest green technologies in its growing range of products under the EcoDynamics umbrella principle, to ensure the company remains ahead of global emissions regulations and continuously improves the average fuel consumption of its entire product line-up. Since then, Kia has also realized an increase in the environmental performance of its supply chain, production centers and logistics operations. We have been recognized for minimizing harmful emissions from our production processes and reducing water use during the manufacturing process, as well as recycling more than 90 percent of the waste generated during production at domestic plants. Kia vows to continue our efforts to leave a greener footprint that goes beyond just our vehicles. Click here to find out more about Kia’s sustainability efforts.